« Emergency Food Prep and Storage Tips: When the Disaster Happens, Are You Ready? There are a number of ways to heat your home. The method you choose depends on where you live and the availability of fuel types in your area. Price can be a factor in your choice, the price of both of the system itself and the fuel. The following discussion of five popular methods to heat your home will give you an idea of your choices for having a warm, cozy home. This heating method uses natural gas for fuel. It requires a gas line to run into your home, and may not be available in all neighborhoods. Older models used a pilot light–a small, continually-burning flame–as a way to ignite the gas for heat. Newer models use an electronic device to ignite the gas. When triggered, the gas fills a number of tubes to create several flames, much like a gas BBQ grill. Air is forced over these tubes and the heated air is circulated through the house through a series of vents. Much of a gas furnace, except for the filter, cannot be serviced by a homeowner and requires a professional experienced with gas systems to do repairs. These furnaces work similar to the gas design. Instead of flames producing the heat, however, electricity is passed through a series of coils that become red hot. A blower pushes warm air through the ductwork. Again, a homeowner can change the furnace filter, but other repairs need to be done by a local service company. When both gas and electric are options for your home, the availability and cost of each fuel type may determine which you choose. This type of home heating is used in about 6 percent of U.S. homes and is predominantly found in the Northeastern states, according to the Christian Science Monitor. Again, availability of fuel types determines the use of oil heat in a home. When the thermostat triggers the furnace, heating oil stored in a tank outside of the home is sent to the burner by a pump. The oil mixes with air to become a fine mist and is then sent to the burner and ignited in a combustion chamber. The heat either warms the air that is then sent through ductwork, or it can be used to heat water that circulates through baseboard heating units. Oil furnaces can also be used to create steam for a radiator. Oil burner service should be left to companies such as The Burner Man Inc because the furnaces need precise oil/air ratios. 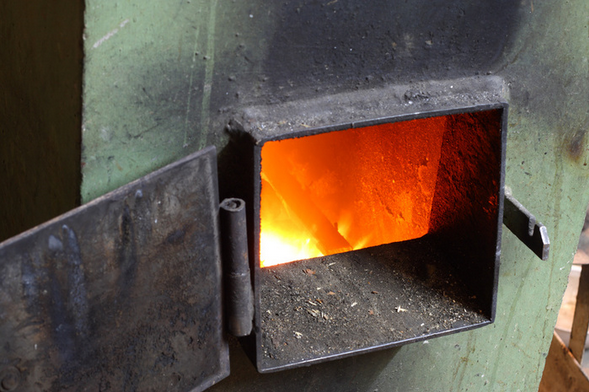 These furnaces also are potentially dangerous due to the high pressures in the systems. This type of heat burns no fuel. It essentially produces no heat, but rather moves existing heat from one place to another, such as from the outside air or the ground into the house. Condenser coils compress the available heat before it is sent through the house. These are most useful in moderate temperature areas of the US. However, you will need a backup gas, electric, or oil system if temperatures dip into freezing. This type of heating relies on hot water circulating through a grid of tubes located in or under the flooring material. This is radiant heat, like a steam radiator, as opposed to forced air heat from a gas or electric furnace. The air near the floor warms and slowly rises to warm the room. Less heat accumulates near the ceiling, and to be effective, you need to install special flooring to support this type of heating. Normal wood flooring traps the heat underneath it. Thin, engineered wood flooring allows more of the heat to come up through the room. Learn about the options you have in your area for heating. Compare prices of fuels and maintenance. Whether you are putting in a new heating system or replacing an old one, the more you know about your options, the better able you’ll be to find that balance between a warm home and a reasonable heating bill.